Fri, Apr 12, 2019, 11:38 am SL Time, ColomboPage News Desk, Sri Lanka. 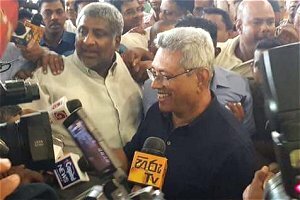 Apr 12, Colombo: Former Defense Secretary and presidential hopeful Gotabaya Rajapaksa who was in the United States on a private visit, returned to the island this morning. Reportedly, a massive crowd has gathered at the Bandaranaike International Airport to welcome the former Defense Secretary. Gotabaya Rajapaksa, who is a dual-citizen of Sri Lanka and the U.S. after returning to the island today has said that during his stay in the U.S. he has taken the necessary steps to denounce the U.S. citizenship. While in the U.S. the presidential hopeful of the opposition party Sri Lanka Podujana Peramuna Rajapaksa have been served notices charging him in two cases on torture and murder during war time. Two cases have been filed in the United States courts against and the brother of the former President Mahinda Rajapaksa by the daughter of murdered editor Lasantha Wickremetunga and a Tamil torture survivor. After his arrival this morning Rajapaksa has reportedly dismissed the lawsuits filed against him as "baseless" and stressed that it will only motivate him and his supporters to push for political change in Sri Lanka. Gotabaya Rajapaksa, who is under prosecution for misappropriating state funds, was required to return to the country today under the travel restrictions imposed on him by the court. The Special High Court granted permission for former Defense Secretary to travel overseas from March 26 to April 12.